Accueil » Joint management » Catalytic decarbonation: the Saur water softening solution proves its effectiveness! Decarbonation... how does it work? The catalytic decarbonation process takes place in a 10-meter high column. Previously diluted with softened water, the caustic soda is injected into the water to be treated as it enters the lower section of the tower. The reaction in which the precipitate crystallises around grains of sand occurs at every level within the tower. The water rises through this tower at a speed of 90 meters per hour. The microsand is gradually covered by an increasingly thick layer of calcium carbonate until it forms spherical pellets of around 1 mm diameter. When these pellets reaches a certain size, there is no longer sufficient surface area for the precipitate to attach itself to. This is the reason why it is important to add new microsand regularly and extract some of the larger carbonate pellets. 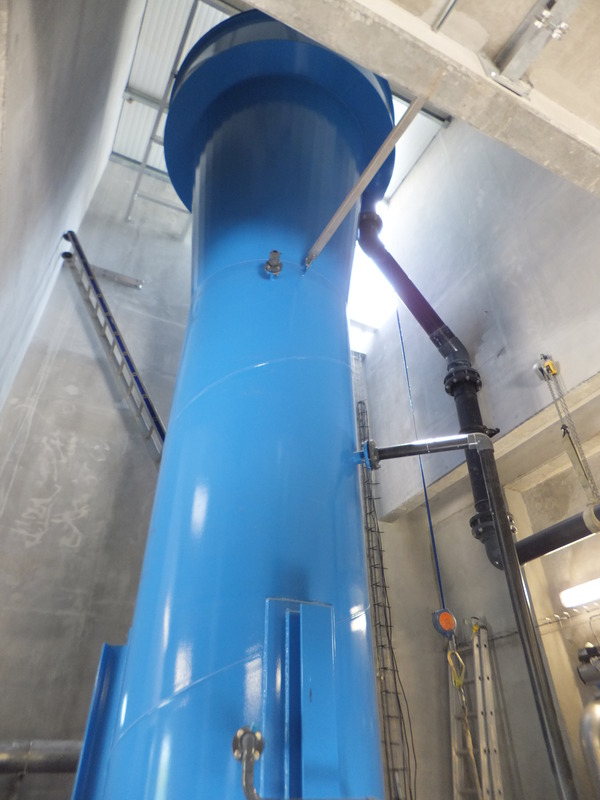 The decarbonated water is separated from these pellets at the top of the tower, which is wider at the top to reduce the water speed and decant the pellets. The carbonate pellets are regularly removed from the reactor and drained in a filtration tank before being recycled for use as a ballast additive. 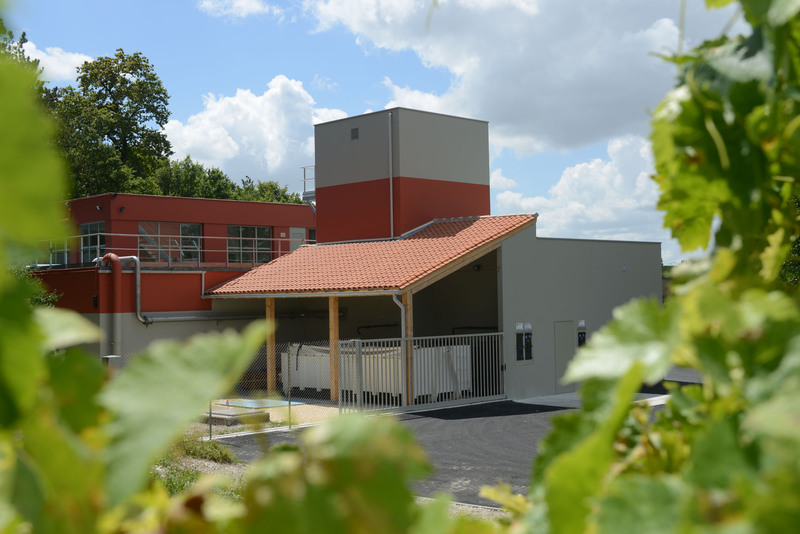 At Criteuil-la-Magdeleine in the Charente region of France, the Bernac drinking water production plant has been using a Calcyle catalytic decarbonation unit for the past four years to significantly reduce water hardness. 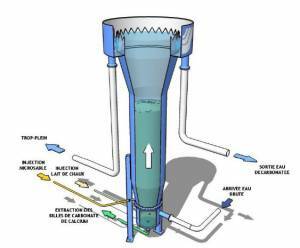 Operated by Saur, the Bernac plant provides drinking water to the 16 communities served by the Syndicat Intercommunal d’Adduction en Eau Potable (Siaep) in Baignes-Sainte Radegonde (population 7,500). The untreated water arriving at the plant is intrinsically very high quality. Only three treatment stages (settling, sand filtration and chlorine disinfection) are needed to supply 2,000 m3 per day to consumers. Nevertheless, its hardness rating is high with a value of around 35°F. This parameter presents no risk to health, but it can cause problems in terms of maintenance and water pipe lifespan. In practical terms, the calcium present in the water precipitates in the form of carbonates which become deposited on pipe walls, and in some cases, these deposits can reduce the flow of water to a trickle. The carbonation effect is not exclusive to the drinking water abstraction network, but can also affect fire hydrants, household appliances and domestic boilers. In 2012, the Baignes water supply syndicat asked its delegated management provider to identify a solution that would effectively reduce the hardness of its water. 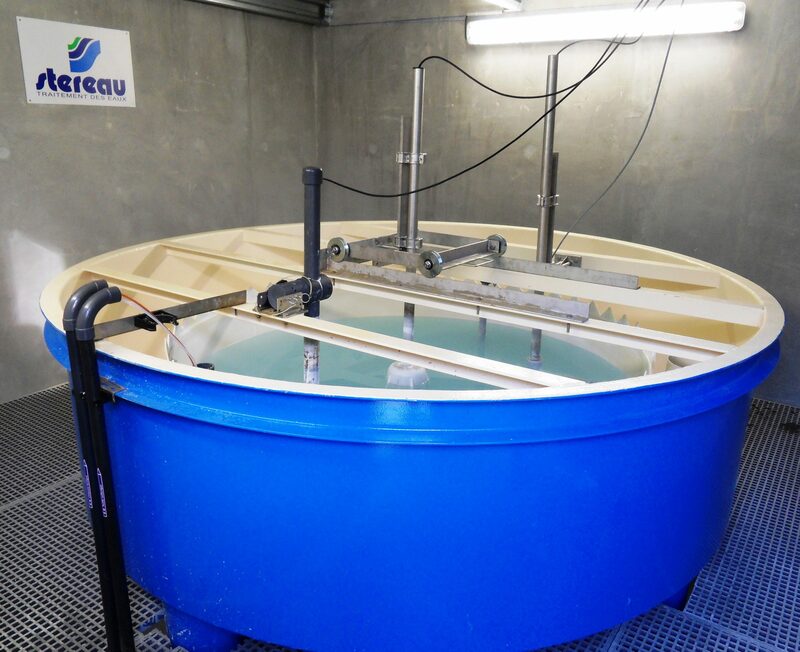 Saur responded to the local authority with a recommendation to install a Calcycle unit, developed under a technology partnership with Brabant Water, the Dutch drinking water production and supply company serving the Brabant region. 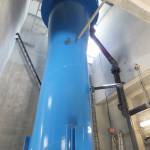 The unit is installed upstream of the existing treatment plant to treat half of the incoming untreated water. 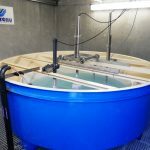 This reduces its hardness from 35 à 15°F, after which the treated flow is blended with untreated water to achieve the required hardness value of 25°F. The addition of an alkaline reagent precipitates the calcium in the water in the presence of a structure on which to initiate the process and gather the precipitate. The Bernac plant has opted to use caustic soda because of the low level of turbidity generated at the outlet of the decarbonation process, operational convenience (few pipeline blockages) and the low sodium content of the untreated water. The treatment tower was drained in January this year to check its condition after three years of operation. The water and caustic soda feed pipes were found to be unobstructed by carbonates, and the wall of the tower remained intact. The only carbonated deposits found were a few at the bottom of the tower. The absence of accumulations in the water and caustic soda feed pipes and the low frequency of maintenance required are the major benefits of this process, which has been used for more than 25 years in the Netherlands. The Calcycle solution offers a number of benefits compared with traditional decarbonation techniques, especially in terms of lower reagent consumption and the need for no additional sludge treatment equipment. The Group already has a number of operational facilities using this solution, including Saint Soupplets (100 m3 per hour – February 2012), Baignes (200 m3 per hour – July 2012) and Montpezat-Puylaroque (350 m3 per hour – December 2013). 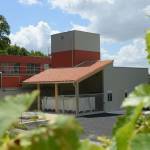 The positive effects of the Calcycle process are clear to see in the Charente region. In operational terms, the filters fitted to domestic meters now need to be changed less frequently, and there have been no examples of complete blockage of any drinking water supply pipelines. From the consumer’s point of view, the immediate initial benefit is the feel of softer water from the shower! This investment, which was planned by the water supply syndicat in 2008 as part of renegotiating its outsourced management contract, did not result in any increase in water prices to cover its introduction.